A limpet mine is a type of naval mine attached to a target by magnets. It is so named because of its superficial similarity to the limpet, a type of sea snail that clings tightly to rocks or other hard surfaces. A swimmer or diver may attach the mine, which is usually designed with hollow compartments to give the mine slight negative buoyancy, making it easier to handle underwater. Usually limpet mines are set off by a time fuse. They may also have an anti-handling device, making the mine explode if removed from the hull by enemy divers or by explosions. Sometimes the limpet mine was fitted with a small turbine which would detonate the mine after the ship had sailed a certain distance, so that it was likely to sink in navigable channels or deep water out of reach of easy salvage. Thus, determining the cause of the sinking is more difficult. 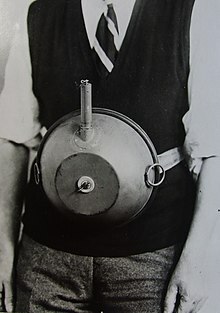 Cecil Vandepeer Clarke wearing an early version of the limpet mine on a keeper plate in the position used by a swimmer. In December 1938, a new unit was created in the British military that soon became known as Military Intelligence (Research) — usually abbreviated as MI(R) or occasionally as MIR. MI(R) absorbed a technical section that was at first known as MI(R)c. In April 1939, Joe Holland, the head of MIR, recruited his old friend Major Millis Rowland Jefferis (1899–1963) as director of the technical section and under his leadership the team developed a wide range of innovative weapons. One of Jefferis' earliest ideas was a type of mine that could be towed behind a rowboat, but which would attach itself to the hull of a ship that it passed. Getting a heavy bomb to stick to a ship reliably was a problem. The obvious answer was to use magnets which should be as powerful as possible. The most powerful permanent magnet in the world—for its size—has been developed in the research laboratories of the General Electric Company in New York. Only half the size of the eraser on a lead pencil, it will lift a flat-iron weighing 5 lb. Its magnetic attraction is several times as strong as that of any previous magnet. The strongly magnetic alloy forming the magnet can be used, too, in electrical equipment to replace electro-magnets that require current. On 17 July 1939, he contacted the editor of the magazine for more information about the magnets; the editor was Stuart Macrae. During World War I, Macrae had briefly worked on a device for dropping hand grenades from aircraft, and he longed for a return to working on such challenges. When Jefferis' call came, he promptly undertook to perform experiments and to produce prototypes. Macrae contacted Cecil Vandepeer Clarke (1897–1961) who was managing director of the Low Loading Trailer Company. Macrae had met Clarke a couple of years previously when he was the editor of The Caravan & Trailer magazine. He had been impressed by Clarke's work and now he needed his expertise and the use of his workshops. Macrae and Clarke soon agreed to cooperate on the design of a new weapon, but they quickly abandoned a towed mine as impractical. Instead, they worked on a bomb that could be carried by a diver and attached directly to a ship. The new weapon became known as a limpet mine. The first versions were assembled in a few weeks. The innovative design included a ring of small strong magnets for adhesion and the detonator used slowly dissolving aniseed ball sweets to provide the necessary time to escape. Just before war was declared, Macrae's name was put forward to Holland who arranged to meet him. Holland considered that Macrae would make a good second in command for Jefferis: He saw Macrae as a capable administrator who could keep his geniuses in order. Macrae joined the War Office as a civilian and Holland saw to it that Macrae got a commission in October 1939 (backdated to 1 September). Clarke joined the top secret Cultivator No. 6 project as a civilian and later joined the army. He served in the Special Operations Executive (SOE) with Colin Gubbins and would later be appointed Commandant of one of the Secret Intelligence Service's schools. He eventually rejoined Macrae when he was transferred to MD1 in 1942. The "rigid limpets" used by the British during World War II contained only 4 1⁄2 pounds (2.0 kg) of explosive, but placed 2 metres (6.6 ft) below the water line they caused a wide hole in an unarmoured ship. SOE agents could be provided with a 5 feet (1.5 m) long placing rod. A smaller version named "Clam" was developed from the British limpet for use on land. It was intended to be used against Wehrmacht Heer armoured fighting vehicles of Nazi Germany, but before the British ever got a chance to deploy it, the Germans adopted Zimmerit coating on their fighting vehicles, which prevented magnetic mines from sticking to the armor. This was because the Germans were the largest user of magnetic mines during the war: since they had invested heavily in their own Hafthohlladung-named shaped-charge anti-tank magnetically-adhered ordnance, they feared that the Soviets, who they were primarily facing after Operation Barbarossa, would easily reverse-engineer their weapon and use it against them. In the end, the Soviets didn't care for the idea of the magnetic mine, and the Germans stopped using Zimmerit for the last year of the war. The British limpet adaptation was not the first magnetic mine and was not the reason why Zimmerit coating was developed. 3 views of a frogman with IDA71 rebreather breathing set, supplied with keeper plate to clip a limpet mine to his chest. One of the most dramatic examples of their use was during Operation Jaywick, a special operation undertaken in World War II. In September 1943, 14 Allied commandos from the Z Special Unit raided Japanese shipping in Singapore Harbour. They paddled into the harbour and placed limpet mines on several Japanese ships before returning to their hiding spot. In the resulting explosions, the limpet mines sank or seriously damaged seven Japanese ships, comprising over 39,000 tons among them. An example of the use of limpet mines by British special forces was in Operation Frankton which had the objective of disabling and sinking merchant shipping moored at Bordeaux, France in 1942. The operation was the subject of the film The Cockleshell Heroes. Another case was Raid on Alexandria (1941) by Italian Navy divers, who attacked and disabled two British Royal Navy battleships in the harbour of Alexandria, Egypt, using manned torpedoes. Limpet mines were also used by the Norwegian Independent Company 1 in 1944 to attack the MS Monte Rosa. On January 16, 1945, 10 limpet mines were placed along the port side of the SS Donau approximately 50 centimetres (20 in) beneath the waterline. These bombs were to detonate once Donau cleared Oslofjord and reached open sea, however, the departure time was delayed and the explosion occurred before Donau reached Drøbak. In 1980, a limpet mine was used to sink Sierra, a whaling vessel which docked in Portugal after a confrontation with the Sea Shepherd. Later that year, about half the legal Spanish whaling fleet was sunk in a similar fashion. No lives were lost. Another use was the sinking of Greenpeace's Rainbow Warrior by French DGSE agents in Auckland harbour, New Zealand, on July 10, 1985, killing one person. Egyptian limpets were modified by the CIA for use by the Mujaheddin in the Soviet Afghan war, and could be attached to Soviet trucks. In the Bangladesh Liberation War in 1971, limpets were used by liberation fighters in Operation Jackpot, in Mongla seaport, Naval Commandos damaged many Pakistani army support ship and gunboats. Argentinian commandos planned to use limpet mines during Operation Algeciras during the Falklands War. ^ Unattributed. Sir Millis Jefferis – New Weapons Of War (Obituary). The Times, 7 September 1963 p. 10 column E.
^ Warwicker 2002, p. pxxiv. ^ John Vandepeer Clarke. "Wartime memories of my childhood in Bedford Part 1". WW2 People's War (BBC). Retrieved 2012-04-10. ^ National Archive. T 166 — Hearing 16 November 1953 — Macrae. Document 328. ^ a b National Archive. T 166-21 Awards to Inventors — Macrae and others. ^ Unattributed. "Limpet Bomb Claim By Inventors — Use Of Aniseed Balls." The Times 17 November 1953 p. 4 column F.
^ National Archive. HS 9/321/8 – SOE Personnel File: Cecil Vandepeer Clarke. ^ Lovell 1963, p. 179. ^ "Operation Jaywick". Australian Government Department of Veterans' Affairs. Archived from the original on 2012-04-22. Retrieved 2012-04-10. ^ "Limpet". The Canvas Kayak Website. Retrieved 4 May 2012. ^ "Paul Watson: Sea Shepherd eco-warrior fighting to stop whaling and seal hunts". Telegraph.co.uk. 2009-04-17. Retrieved 2012-04-10. ^ "The Sea Shepherd". The Sierra Campaign. Retrieved 2012-04-10. ^ Bremner, Charles (July 11, 2005). "Mitterrand ordered bombing of Rainbow Warrior, spy chief says". Times Online. Times Newspapers. Archived from the original on 2007-02-22. Retrieved 2012-04-10. ^ "Rainbow Warrior sinks after explosion". On This Day. British Broadcasting Corporation. July 10, 1985. Retrieved 2012-04-10. Bunker, Stephen (2007). Joanne Moore (ed.). Spy Capital of Britain: Bedfordshire's Secret War 1939–1945. Bedford Chronicles Press. ISBN 978-0-906020-03-6. Ismay, General Lord (1960). The Memoirs of Lord Ismay. Heinemann. ISBN 978-0-8371-6280-5. Lovell, Stanley P (July 1963). "Deadly Gadgets of the OSS". Popular Science. Bonnier Corporation. 183 (1): 56–59, 178–180. Retrieved 14 April 2012. MacKenzie, S. P. (1995). The Home Guard — A Military and Political History. Oxford University Press. ISBN 0-19-820577-5. O'Connor, Bernard (2010). 'Nobby' Clarke: Churchill's Backroom Boy. Lulu. ISBN 978-1-4478-3101-3. Seaman, Mark (2001). Secret Agent's Handbook. First Lyons Press. ISBN 1-58574-286-4. – The bulk of this book is a reprint of National Archives documents HS 7/28 and HS 7/28. Macrae, Stuart (1971). Winston Churchill's Toyshop. Roundwood Press. ISBN 978-0-900093-22-7. Thomson, George; Farren, William (1958). Fredrick Alexander Lindemann, Viscount Cherwell. Biographical Memoirs of Fellows of the Royal Society. 4. Heinemann. ISBN 978-3-8423-3944-6. Warwicker, John (2002). With Britain in Mortal Danger: Britain's Most Secret Army of WWII. Cerberus. ISBN 978-1-84145-112-1. "HS 7/28: Descriptive catalogue of special devices and supplies". The Catalogue. The National Archives. "HS 7/30: Information on weapons, portable transmitting and receiving equipment; With diagrams and booklet". The Catalogue. The National Archives. "T 166/40: Awards to Inventors, CV Clarke, supplementary evidence". The Catalogue. The National Archives. 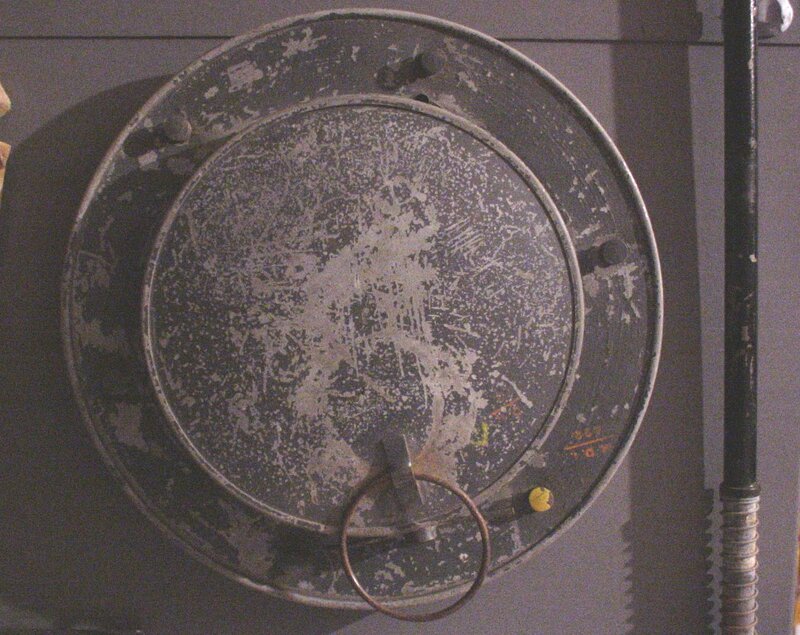 "Mk 1 Limpet Mine" (jpg). Retrieved 2012-04-10.